As the end of 2017 nears, you may be feeling pressure to make sure you close the year out strong. If you’ve been sitting on the fence regarding VoIP, this may be the perfect time to switch. VoIP options had never been better or more full-featured than they are now, and it may be just the thing your business needs to see a productivity and profitability boost. 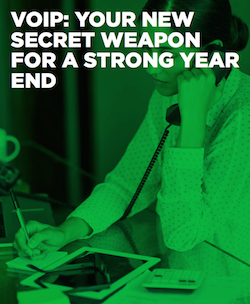 To learn more about VoIP and why you should switch now, read this guide on why VoIP is the Secret Weapon for a Strong Year End. How Big Does Your Business Need to Be for "Big Data"? The fact that robots are capable of attending to customer quandaries is an understatement. Here's how AI and its subset technologies are making it all happen.